Yarn from my favourite yarn supplier. It's 85% wool and 15% nylon... Not quite as nice to knit but will suit someone who would like something that wears a little longer. Australian yarn hence the colour name and very apt since this is where I am. I used this toe up arch shaped pattern. I used my own favourite heel shaping tho. For the side panels I used Teal goo chart . It looks ok but is certainly asymmetrical! 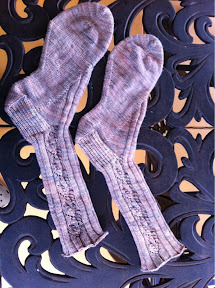 The reason I knit socks is there isn't much that has to endure the sewing needle treatment! I'm even happier now This way is a very smooth edge and voila no sewing needle required!